Kings Langley striker Mitchell Weiss almost grabbed an equaliser from a tight angle at the end of Saturday's game. (File picture by Chris Riddell). 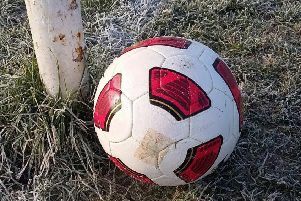 Playoff hopefuls Kings Langley deserved a draw at top-three side Metropolitan Police on Saturday, but ended up going down to the team for the second time in 11 days. The reverse fixture on March 5 ended in a 2-1 reverse at the Sadiku Stadium and Kings, in sixth place and only out of the playoffs on goal difference, wanted a measure of revenge here against their third-ranked visitors. Unfortunately, unrelenting gale-force winds spoilt this crunch clash between two sides who usually play inter-passing, fast-flowing football. Kings’ Josh Coldicott-Stevens regained a starting role in place of the injured Dylan Switters and Andronicos Georgiou returned to the bench after an illness that had kept him out of the side’s fine win over Salisbury the previous weekend. The Met played with the wind in their favour in the first-half and got the first real chance after 20 minutes when Mikel Platt was foiled by a superb Callum Adebiyi tackle as he pulled the trigger. Jacob Cook almost got Stevie Ward through at the other end five minutes’ later, but Kings were finding the wind an effective 12th opponent. The home side came close when a Junior Eldstal header grazed the bar and a 40-yard power strike by Nesta Guinness-Walker was just over. But six minutes before half-time, the pressure told when an Ethan Chislett shot was deflected into the net via the post by Luke Robertson for a 1-0 lead. With weather conditions now marginally in their favour, Kings had by far the better of second-half possession. But the sheer unpredictability of the path of the ball was frustrating both sides and the game took on an edge when a solid-looking Langley back line caught home forwards offside on several occasions and the Met strived to protect their slender advantage. Kings striker Rene Howe was just wide with a shot, Cook combined with Ward to finish off a flowing move only to be ruled offside and a dipping Coldicott-Stevens free-kick was deflected for a corner . When the ball was on the ground, both teams showed the kind of play that they are capable of, but those were brief interludes and an ever-increasing cast of balls spent far too much time in the air, some even exiting the pitch area as if in protest. Mitchell Weiss just failed to get round Bertie Schotterl from a tight angle to salvage a deserved draw for Kings, but it was the Met who had the last chance when Oliver Knight shot wide on the break with virtually the last kick of a disappointing match. 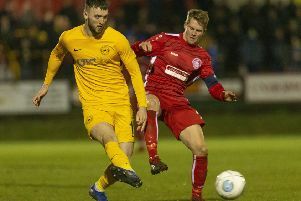 Despite the defeat, Kings remain in sixth place and are just three points adrift of the fifth and final playoff spot but with a game in hand over that team, Poole Town – although Poole have a vastly superior goal difference. Just eight games remain and this Saturday Kings host 13th-placed Wimborne Town.